Memorial . Lillers Communal Cemetery V. A. 16. 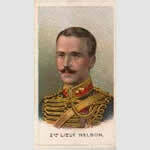 OH 1914 Vol 1 Nelson, Sgt. D. (R.H.A. ), at Nery, 238, 239 Towards 6 A.M. Brigadier-General Briggs, after strengthening his own right, ordered two squadrons of the 5th Dragoon Guards, his last remaining reserve, to attack the enemy's right flank. They accordingly galloped northwards and then wheeling to the east, dis- mounted and pushed in to close range. Whilst the 1st Cavalry Brigade was thus holding the German Jfih Cavalry Division, in response to General Briggs' call for assistance, just as the mist began to thin in the morning sun, the 4th Cavalry Brigade and I Battery came on the scene from St. Vaast on the north-west, followed by a com- posite battalion of the Warwickshire and Dublins of the 10th Infantry Brigade from Verberie from the same direc- tion, and the 1 /Middlesex from Saintines in the north. Four guns of I Battery unlimbered two thousand yards south-west of the German position. As it did so, the fire of L Battery ceased ; and for good reason. For some time its fire had been desultory. Lieut. Munday had been several times wounded, and man after man was struck down until there only remained Captain Bradbury, who was still untouched, and Sergt. Nelson, who had been wounded. Battery -Sergeant -Major Dorrell then joined them, and immediately Captain Bradbury, whilst fetching ammuni- tion from a wagon twenty yards off, fell mortally wounded. The survivors continued to fire until the last round was expended, and then but not till then L Battery was silent. Gained V.C. while serving with L Bty. R.H.A. on Sept. 1st, 1914. An extract from the London Gazette (No. 28976, dated 13th Nov., 1914), records the following-Helping to bring the guns into action under heavy fire at Nery on 1st September, and while severely wounded remaining with them until all the ammunition was expended-although he had been ordered to retire to cover. Son of the late George and Annie Nelson; husband of A. J. Jessie Nelson, of 92, Ranelagh Rd., Ipswich. Native of Deraghland, Co. Monaghan, Ulster. 9 April - 29 April 1918. As the first phase of the great German campaign of 1918 lost momentum and failed in its objective to split the British and French armies, subsidiary attacks were shift the balance of the attack and to seek opportunities to exploit other sectors. On the Lys the Germans initially enjoyed spectacular success against a Portuguese Division but the gap was soon plugged and the advance halted.